The 47 story, 459-home luxury condominium tower located at Third and Virgina in Seattle is OPEN for previewing this Saturday, 10/27! First Light features bright + open studio, one bed, two bed, three bed, and penthouse floor plans overlooking all that downtown Seattle has to offer. 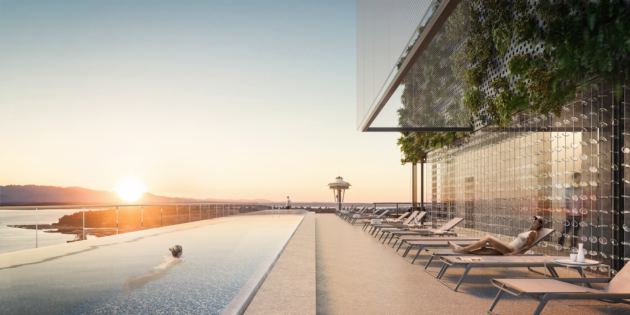 The top three floors will be dedicated to amenities only, including a soaring lap pool floating over the edge of the 46th floor, 24/7 concierge, a residential Salon, Wellness + Fitness center, a Secret Garden, and more! First Light is an introductory project from Westbank, an international firm known for creating high-quality buildings with award-winning architectural designs. Conveniently located near Pike Place Market, restaurants, and the famous Seattle waterfront, Westbank’s overall vision was to include artistic architectural components throughout to take the Seattle project to the next level. Interested in learning more about First Light? Contact us today and we will register you to receive exclusive details/updates and early access opportunities!